Emerson have long been known for their tactical, fighting-and-defense oriented blades, usually in black G-10 with very simple hardware. Spyderco is renowned for their utilitarian design and unusual aesthetics, rendered in grippy plastic with a bulbous thumb-hole opener. And while Spyderco has long been held in high regard for their individuality, they are also known for their collaborations with other designers and brands. The Endura 4 Wave Emerson Opener is a great example of this: the classic lightweight design of the 4th generation Endura with the tactical advantage of Ernest Emerson’s self-opening brainchild. Let’s take a look! The Endura, along with its ¾-scale sibling Delica, has been a staple of the Spyderco lineup since its debut in 1990. The waved variant of the Endura was produced in a limited run of 500 units during Endura 3 production, and became a full production variant when the Endura 4 debuted in 2006. Does the inclusion of the wave make the Endura better? The waved Endura’s blade comes in just shy of 4” of length, which to me puts it out of the realm of practical EDC knives. As we’ll see more in the review, that’s not really the point. Of note is that Spyderco etches the Emerson patent number into the blade of the Waved Models, a nice touch. The star of the show is the hook cut into the spine of the blade forward of the 13mm “spyderhole,” which is more pronounced and forward (rather than upward) than Emerson’s own waves. It’s ugly, let’s be straightforward. This is certainly not a public friendly design. People generally recoil in horror and shield their children from this alien looking cutting device. Seeing as how Spyderco cuts the wave into the existing blade profile of an Endura rather than extending it upwards like Southern Grind, Kershaw, or Emerson, they leave the other half of the blade with a narrow strip for a primary bevel. What I’m getting at here is the sabre grind doesn’t cut particularly well. You won’t want to use this thing for food prep or detail work, it’s too thick and being 4” long it’s too unwieldy. If you want an Endura that really cuts, Spyderco sells non-waved versions in a beautiful full-flat-grind in either VG-10 or Hitachi’s superior ZDP-189, but you won’t be able to scare bystanders waving it open. What it is designed for, very bluntly, is self-defense. We will avoid getting into the semantics of knives as self-defense tools and say that a 4” sabre ground blade is great for that purpose. Plenty of reach, a lot of metal behind the tip for piercing strength, an upswept blade for slashing cuts, etc. What was once one of the best folding knife designs in the world is lately a little behind the curve on ergonomics. This is analogous to saying that a 1996 BMW M3 is outdated. Who cares? It’s still a fantastic driving car. And the Endura is still an all-star ergonomically as well as on a weight-to-content ratio. The handles are bi-textured FRN (fiberglass reinforced nylon) riding atop skeletonized stainless steel liners for additional strength. The waved Endura weighs in at 3.6 ounces, which is remarkably light for a 4” blade with steel liners. It’s old-school Spyderco: grippy, solid plastic handles, a sharp thumb ramp with jimping, and a lockback with a Boye detent. There are two disappointing ergonomic issues, though. Primarily, the lack of a forward finger choil! On a 4” long blade I’d happily give up some sharpened real estate for a forward grip option. Also, the tang of the blade sticks out about a quarter of an inch while in the closed position, which is obnoxious when putting the blade into your pocket. The E4 wave is comfortable in a forward or reverse grip, but the curved profile of the handle feels unnatural reversed in an ice-pick grip. Speaking of grip, worth mentioning is the excellent texturing on the FRN handles – in a world of pocket-destroying G-10, slick and heavy aluminum, expensive and crack-prone carbon fiber, there’s something refreshing about these simple but super-effective handles. Also, they’re chemical-resistant, so you can clean them off with a solvent and water/a blow gun, they don’t scratch or discolor, they’re never hot or cold, they’re light, etc. FRN is great for these reasons, and Spyderco does FRN exceptionally well. That’s the sound of showing the 100th person how the wave works. They never cease to be amazed. I never cease to be amused. I’m sure I’m preaching to the choir here, but if you’re unfamiliar the Wave Opener is Ernest Emerson’s modernized take on a Quillion, a protrusion from the spine of the blade designed to catch itself on the corner of your pocket and pull the blade open as you retract it. With the clip configured for tip-up carry, left or right hand side, you grasp the handle of the blade, tilt slightly back, and pull out sharply. The hook grabs your pocket and the blade rotates open as you draw. With a world filled with assisted openers, bearing pivot flippers, automatics, bolster-lock automatics, cross-draw sheaths, gravity knives, and everything else, we can at least agree on this: nothing goes from concealed and safe to open and locked up faster than a Waved knife. Nothing. It’s in your pocket one second, the next second it’s open and locked and in your hand. It never gets old, even if the details of the knife may. The obvious intent is self-defense. 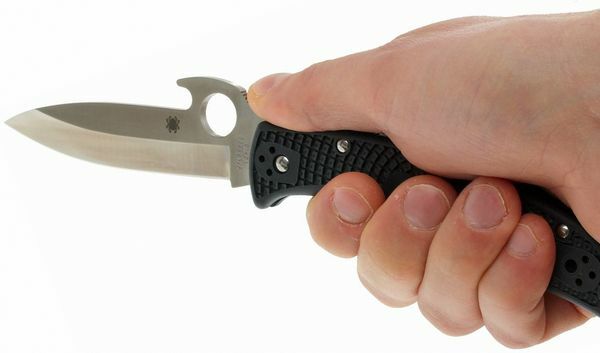 If a mugger is politely asking for your wallet, waving open a 4” Spyderco instead could be a powerful mental deterrent. But beyond arguably unrealistic expectations of using a knife in a self-defense function, a wave opener is awfully handy in a situation where your other hand is holding something you need to cut. It doesn’t require you to divert your attention away from the task at hand. And while we all enjoy absent-mindedly flipping open our knives to the great annoyance of our significant others, sometimes all you want is a tool that works in a predictable fashion without having to think about it or look at it. Sadly, not everything with relation to the wave is peachy. I’ll preface this by saying I’ve owned my waved Endura for almost a decade now, but the amount of vertical blade play – or “lock rock” is more than I find acceptable for a knife I actually use to cut things. Horizontal blade play is merely an annoyance, but lock rock is a safety concern. The biggest feature is obviously the wave opener cut into the spine, which works great. Humorously, the Waved Endura offers 4 position clip orientation – only two of which will actually function to wave the knife open (as it must be configured for tip up carry to work). This is because it shares the same FRN handle scales as every other Endura 4, and there’s no point in creating separate scale molds, but the mind can’t help but wonder how many people out there have one of these configured for tip down carry! The body is screw construction so you can disassemble and clean the knife – I advise that you don’t, as it’s a huge pain to get the lockbar and backspacer back in under tension! A David Boye detent helps to prevent accidental lock release during a heavy grip. As with any painted clip, a few years of use sees most of the coating worn off, but that’s to be expected. I’ve used the Waved Endura on-and-off for going on ten years now, and I can say unequivocally that it will cut things. I know that’s awfully non-specific, but truth be told it’s not an exceptional user knife for doing actual knife things. Not enough belly, too much metal behind the edge, not a real fine point for piercing, not a great steel – it’s a decidedly middle of the road user knife. Without a shadow of doubt, a full-flat-ground Endura 4 would be a better user for things one actually does with their knife. That’s the no-bull unbiased observation as a working knife. Of course, that’s arguably not the point of this knife. The Waved Endura is a knife centered around an endearing gimmick, which even in practical purposes is a useful one, and it’s also a stellar self-defense blade. I’ve never had to use a knife for such a purpose, but when I feel the need may arise it does give me peace of mind in pocket – which is probably what matters. Here’s where it gets interesting. At about $80 on Amazon or BladeHQ, the Waved Endura is considerably cheaper than most any real Emerson you can get your hands on. To get a comparably sized and shaped Emerson, you’re looking at the CQC-8 SF Bowie with a 3.9” 154CM chisel-ground blade, black G10 and… a retail price of ~$230! If you don’t mind a smaller blade, the Mini CQC-15 SF Tanto at ~$180 features a titanium liner lock and a recurved tanto 154cm blade at 3.5”. Of course, you’d be remiss if you didn’t consider one of the Kershaw/Emerson collaborations that have come out recently. Designed to be more price-accessible to more people, the larger Emerson Kershaws represent a tremendous value. The largest of them, the CQC-4KXL has a 3.9” upswept spear point blade in 8Cr14MoV steel, with G10 scales and stainless framelock for ~$40. For something smaller, the Kershaw CQC-6K has a 3¼” 8Cr13MoV clip point blade, and the same black G-10/stainless handle construction for ~$35. What really makes the “real deal” Emersons a tough sell are the two Zero Tolerance/Emerson collaborations. The ZT 0620CF retails for $240, within spitting distance of the CQC-8 SF mentioned earlier. It’s a slightly shorter 3.6” blade, but it’s made in ultra-high-end Carpenter CTS-204p steel (similar to Bohler M390 and Crucible CPM-20CV) with a stunning two-tone satin grind/stonewash flat finish, and a textured carbon fiber show side. Oh, and it’s a full titanium framelock – with a stainless lockbar insert to avoid sticking and wear. There’s also a regular version of the ZT 0620 with a black-coated Elmax blade and G10 handle for $200. And if you don’t like tantos, the new ZT 0630 is a ZT interpretation of the CQC-8 Bowie, with a satin/stonewashed 3.6” S35VN blade, a 3/8” hex nut pivot like the old school ZT’s, and a G10 scale over titanium liner lock for $200. All rendered in ZT/s predictably impeccable fit and finish. I’ve briefly played with a well-worn 0620 and it is a knife beyond reproach. There are a few interesting left-field choices, of course. The Southern Grind Bad Monkey in the carbon-fiber 4” drop point model brings a Sandvik 14c28n blade, svelte looks, proprietary hardware, and a hefty $250 price tag. There’s also the DPX HEST/F Mil Spec ($200), produced by LionSteel in Italy – with a 3.25” drop point blade in Sleipner (similar to D2) steel that has a cutout on the back which can function as a wave or a bottle opener. Finally, Spyderco itself offers a number of models now with the Emerson wave – including the Delica 4 with a 2.9” VG10 blade. There is also the Matriarch, with a fully serrated double recurved blade designed specifically for defensive use. The Spydero Endura 4 Wave is a knife that suits a particular purpose – and some of its design features to suit that purpose hinder its functionality in other more practical applications. Still, Porsche 911’s don’t have a lot of luggage space, and you don’t hear people complaining about that. As a lightweight EDC blade, I still believe that the utility of the Emerson opener is outweighed by the sacrifices in blade profile and lock performance that the opener necessitates. The Matriarch (which uses Endura handles) actually makes more sense, as there is hardly a pretense of practicality to its blade shape, and serves the self-defense purpose even better. Myself personally? I’d much rather have a full-flat-ground Endura in ZDP-189. Or for the same approximately $80, I’d take a translucent blue Manix2 Lightweight in CTS-BD1 every day. Verdict: Decent option if you’re set on a Wave opener, but consider the drawbacks.